The distance to default (DD) and the probability of default (PD) are the essential credit risks in the finance world. It provides an estimate of the likelihood that a borrower will be unable to meet its debt obligations. It is crucial to know which parameter effects more on DD and PD so that investor will prevent future risks. The purpose of this study is to investigate the effects of four parameters (asset value of firm V, value of debt X, interest rate r and the volatility of asset σ at one period) on DD and PD. The Black Scholes model is used to estimate the DD and PD. To explore the effects of parameters, the author used Taguchi’s L27 orthogonal array, analysis of variance (ANOVA) and analysis of mean (ANOM), and the analysis will carry out using MINITAB software. The effect of parameters will be discussed with the main effect plot and the average response on a response plot showing the best outcomes. ANOM identified the optimal combination where the DD is a maximum, and the PD is a minimum. The percentage contribution of each input factor on DD and PD was estimated by conducting ANOVA. The above two (DD and PD) exists an inverse relationship. The rank or percentage contribution will vary with change in the data set. Designs of experiment (DOE) have delineated the significance of utilising cost-effective and simple to analyse design structures in multifactor examinations. Since the mid-1980s, the scan for quality inside items and procedures has prompted expanded use of such techniques. One of the powers behind this quality drive has been crafted by Genichi Taguchi, a Japanese designer. He has made utilisation of plan and investigation techniques for little run multifactor experiments which have contributed altogether to the ongoing and proceeded with an accomplishment of Japanese industry. These systems, generally called Taguchi methods, have come to be connected in the Western industry with some achievement. Indeed, Taguchi techniques are frequently synonymous with the use of experimental designs in numerous associations. Taguchi strategies speak to straightforward yet novel uses of classical experimental designs. Design of experiment utilising the Taguchi symmetrical cluster approach can financially fulfil the requirements of solving problem and items structure advancement ventures. By applying the Taguchi’s strategy analysts, architects and researchers can diminish the time, assets and cash required for minimal exploratory examination. DOE gives the connection between the input and output variables. It utilising the Taguchi Orthogonal cluster approach requires legitimate arranging, the shrewd game plan of the examinations and investigation master of results. The Taguchi’s strategy turned into the standard technique for DOE application. It became up a standout among the best DOE for researchers and architects. The fundamental point of the DOE is to get more and sensible data in regards to the input and output variables. To get the more and sensible data, huge numbers of trails are required, yet the advanced hypothesis of examinations demonstrates that it is not in every case right. The greatest number of investigations, the immense will be an error and it prompted all the more exorbitant. It is smarter to assemble more and sensible data while doing fewer examinations. A standout among the best and better precedents is Taguchi’s technique. The Taguchi has built up a procedure to study the entire procedure parameters with just least adjusted trials, called orthogonal arrays. The fundamental point of DOE (Taguchi’s strategy) is to take a gander at which parameter (input) impacts more on yield. Define the responsible/experimental value. The responsible variables are DD and PD in this work. Selection of input/independent parameters. The DD and PD are depending on some parameters, that such parameters are called the input parameters. The input parameters in this study are asset value of firm V, value of debt X, interest rate r and the volatility of asset σ and time period T.
Choosing the levels. If the performance variables are a linear of the input parameters, then the number of levels shall be two. However, if the response variables are not linear then one could go for three, four or higher levels. Choosing the orthogonal array. This step is based on the input parameters and the chosen levels. The orthogonal array is an intelligent subset of the parameter space to represent a huge number of decision variables. Conduct the experiment and analyse the data (applying ANOM and ANOVA). Therefore, Taguchi L27 approach, ANOM and ANOVA are used in order to identify which parameter effect more on DD and PD. A firm will know which factor effects more on DD and PD so that a firm will look at that factor. The Taguchi’s method is used in every field such as engineering, chemistry, physics etc. in order to get more and efficient information regarding the parameters with a minimum number of experiments. It reduces the time, cost and resources. Park et al. (2017) investigated the factors that effects on powder-binder (P-B) separation in powder injection modelling. The factors are power size, initial powder volume, injection temperature and shear rate. The Taguchi method was used in order to identify which factor effects more on powder-binder separation in powder injection modelling. It was shown that initial powder volume fraction is a most necessary factor for P-B separation. Celik et al. (2018) investigated the percentage contribution of parameters like thickness, Reynolds number, width and pitch on friction. It was measured that the percentage contribution of thickness, Reynolds number and width on friction are 53.85%, 16.64% and 27.27% respectively and the factor pitch has a negligible effect on friction by using Taguchi method and ANOVA. Madhavi et al. (2017) used the Taguchi’s method, S/N ratio and ANOVA in order to identify which parameter effects more or less on optimization of selected properties like hardness and surface roughness. It is shown that the material has a significant effect on above property. The cutting speed and feed rate had a moderate effect on hardness and surface roughness. Sankar (2017) investigated which parameter (parameters are speed, depth of cut, feed and nose radius) effects more on AISI 52100 bearing steel. The Taguchi’s L27 method and ANOVA were used in order to identify that nose radius is the most significant controlled factor among the parameters that are mentioned above. Apparaoa and Birru (2017) investigated which one of the parameter (pouring temperature, die temperature, filling time and injection pressure) effects more on the porosity formulation of aluminium alloy die casting. This study was based on the Taguchi’s method and ANOVA. In this study, it was shown that variations of the die casting process have a significant effect on the porosity formulation of aluminium alloy die casting. Chan et al. (2014) used Taguchi’s L9 orthogonal array in order to estimate which factor effects more on liquid yield from the catalytic pyrolysis of empty fruit bunch (EFB). It was shown that the catalyst loading has a significant effect on liquid yield from the catalytic pyrolysis of EFB. The parameters that were used in this study are catalyst loading, type of catalyst, nitrogen gas flow rate and catalyst loading. Dar and Anuradha (2018) used Taguchi orthogonal L9 array, ANOM and ANOVA in order to identify which parameter affects more on PD. It was shown that the volatility affects more on PD. Therefore, the objectives of this study are (a) to investigate which parameter impacts more on the response variable (PD and DD), (b) also measure the best combination where the value of DD is a maximum and value of PD is a minimum and (c) to check whether DD is a proxy measure for the PD. In this study, the four parameters (asset value firm, value of debt, interest rate and the volatility) are varied at three levels. The process parameters and the selected levels are presented in Table 1. And assume that the values remain fixed once they are chosen. The methodology used for the research work is as per details as shown in Fig. 1 given below. If the value of firm exceeds the debt, i.e. V > X, in this case the debt holders will receive X and the shareholders will receive V – X. If the value of debt exceeds the value of firm, i.e. V < X, in this case the debt holders will receive X and the shareholders will receive nothing. Note: V = X can be collected under (b) scenario. It implies that the values of firm’s equity at time T corresponds to the payoff of a European call option on V. All this makes us think about the BSM. The famous option pricing model—the Black Scholes and Merton formula—tells us that the value of equity is equal to the European call option of BSM. N (*) is the cumulative distribution function (CDF) on a standard Gaussian (i.e. N (0,1)), σ is volatility of assets (value of firm) and r is risk free rate on the market. Under Merton’s model, a firm will default only when value of firm is less than the debt at maturity time T.
This study is based on the DD and probability of default (PD). “The PD is a credit risk which provides an estimate of the likelihood of a borrower who will be unable to meet its debt obligations”. The DD is defined as “it gives u\s idea that how much a firms value is above the threshold value”. Notations: “V is value of firm/asset, X is a debt value, σ is volatility of assets, T is time period and r is the continuously compounded risk free rate” (Valverde, 2015; Wang, 2009) (Dar et al., 2019). The Taguchi approach is approved in this paper in order to identify which parameter effects more on DD and PD at one period. Its aim is to find the relation between the input and the output variables/factors. The Taguchi approach is a DOE whose aim is to gather all the relevant and efficient information regarding the parameters but the Taguchi gather approximately all relevant with less number of experiments. The Taguchi approach or Taguchi orthogonal array is a design matrix that permits the planner of experiments to test combinations of design factors that interact at various levels by carrying out a reduced number of experiments. Dr. G. Taguchi developed this method in order to look for the relationship between the inputs and the output with the fewest number of experiments and it banishes the disadvantages of full factorial design (FFD). The FFD takes a lot of time (time consumption), cost, resources because the number of experiments is high. Obviously, if the number of experiments is high, cost, time and resources will be more (Krishnaiah & Shahabudeen, 2012). The Taguchi method is a very good approach because as compared to FFD, it reduces the number of experiments, cost and resources. If we talk about the 3 levels and 4 factors, as per FFD, we need 81 experiments but as per Taguchi method, a minimum of 9 experiments are required but here the authors choose 27 trails, see Fig. 2. The following standard orthogonal arrays are commonly used to DOE. The data that are given in Table 1 are enough to calculate the values of DD and PD by using Eqs. 4 and 5. The experiment layouts for DD and PD process parameters by using Taguchi L27 approach are shown in Table 2. These experiments are not randomly selected but it is based on some well-defined procedure or sampling (Unal 1991). Table 2 shows responses based on which factors are optimised. 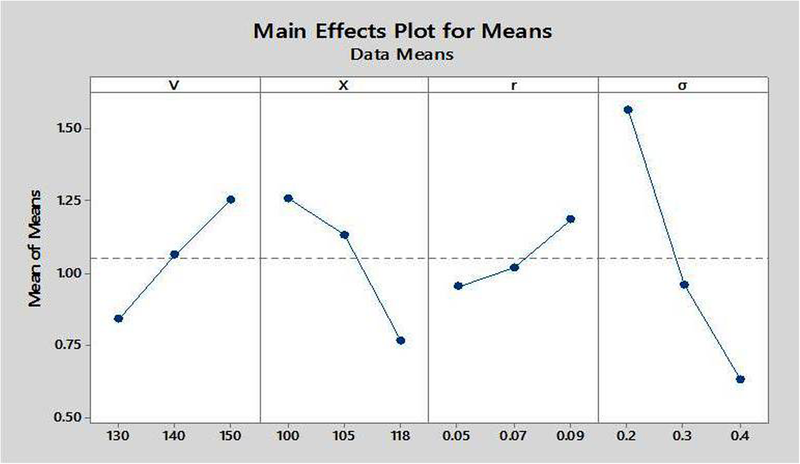 The R-sq is a statistical measure which provides information how close data are to be fitted regression line. The R-sq of DD and PD is equal to 97.87% and 98.99% of the variation in the response variable. It indicates that the model provides enough fit to the data. Note: “The normal plot of the residuals is used in order to verify the assumption that it follows the normal distribution. It was found that the residuals approximately follow straight line” (Dar and Anuradha, 2018). 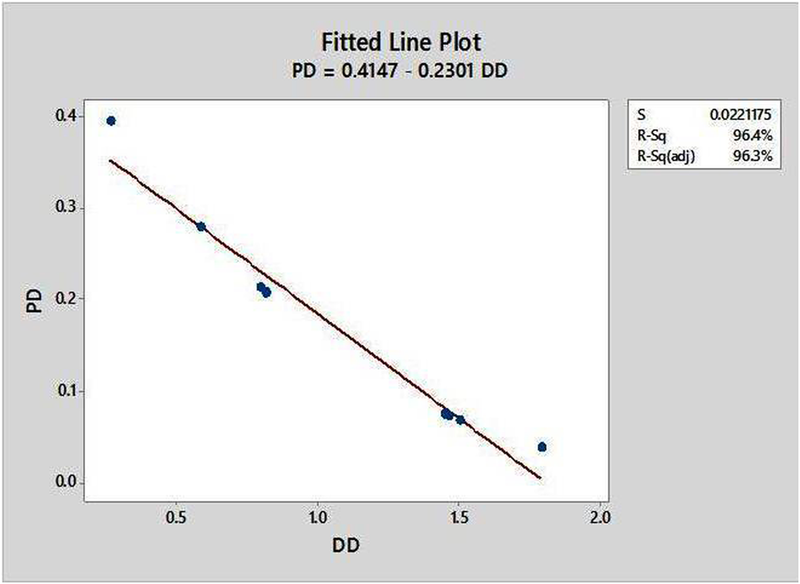 We can use the fitted line pot (FLP) in order to display the relationship between the DD and PD in a Minitab. In FLP, i.e. Fig. 3, it is clearly shown that there is a negative relationship between DD and PD. It means when DD increase, the PD will decrease and vice versa. The R-sq is approximately equal to 96.43%; the data fits better in the model. It indicates that the model provides enough fit to the data. The relation between DD and PD is negative which indicates that, when DD increase, the PD will decrease and vice versa as shown in Fig. 3. The mean values (ANOM) of DD and PD for each parameter at different levels were calculated by using MINITAB software. These mean values of DD and PD for each independent variable at three levels are given in Tables 3 and 4 and Figs. 4 and 5 by using statistical software Minitab. Look at Table 3 and Fig. 4, it clearly is shown that volatility σ affects more and the interest rate r affects less on DD. The selected numbers (italic) in Table 3 are the maximum in every column. It concludes that the best combination is V3 ∗ X1 ∗ r3 ∗ σ1 because the higher DD is the best that is why the authors choose the ranking from high to low (it means that—larger the better). If you choose any combination from Table 1, you will not find a single combination where you will get maximum value of DD than V3 ∗ X1 ∗ r3 ∗ σ1. Look at Table 4 and Fig. 5, it clearly is shown that volatility affects more and the interest rate affects less on PD. The selected numbers (italic) in Table 4 are the minimum in every column. It is concluded that the best combination is V3 ∗ X1 ∗ r3 ∗ σ 1 (smaller the better). If you choose any combination from Table 1, you will not find a single combination where you will get minimum value of PD than V3 ∗ X1 ∗ r3 ∗ σ1. 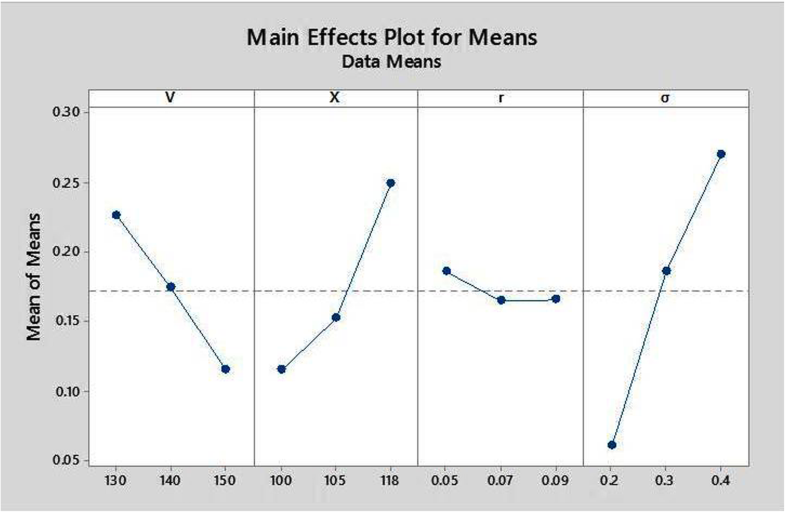 Details of the analysis of variance are shown in Table 5 and Table 6. The p value is less that 0.005 which indicates that there is difference between the treatments among the four firms. The percentage contribution of asset value of firm V, the value of debt X, interest rate r and the volatility σ on DD at one period is 12.39%, 18.82%, 3.83% and 62.81% respectively as shown in Fig. 6a, and the percentage contribution of Asset value V, the value of debt X, interest rate r and the volatility σ on and the PD at one period is 16.29%, 25.28%, 0.52% and 57.84% respectively as shown in Fig. 6b. The fitted line pot (FLP) displays the relationship between the DD and PD. It is clearly shown that there is a negative relationship between DD and PD. It means when DD increase, the PD will decrease and vice versa. From ANOM, one can conclude that volatility σ affects more and interest rate r affects less on DD and PD among the four parameters at one period. The best combination among the four parameters is (V3 ∗ X1 ∗ r3 ∗ σ 1). This combination will provide a maximum DD and a minimum PD. The ANOM measure only which parameter effects more or less on DD and PD, but the ANOVA estimates the percentage contribution of each parameter on DD and PD at one period. It was shown that volatility σ has higest contribution and interest rate r has lowest contribution in both the models (DD and PD). In this study, an application of Taguchi L27, ANOM and ANOVA were applied successfully. Both the statistical models (ANOM and ANOVA) displayed the same result. We are grateful to Chief Editor Nezameddin Faghih and the reviewers for their insight comments and suggestions throughout the review process. Finally, we (Brothers) wish to thank our parents for encouraging us throughout the study. Corresponding author: the completion of this study would have been not possible if not dependent on the steadfast support and the encouragement of my wife (Samiya Jan) for her motivational speeches. The process parameters and the selected levels are presented in Table 1. Design the study: AAD. Collected the data: SQ. Analysis and interpretation of data: AAD and AQ. Drafting of manuscript: AAD. All the authors read and approved the manuscript. Special Thanks to Ikram Un Nabi Lone, Department of Physics, B S Abdur Rahman Crescent Institute of Science and Technology for his helpful suggestions for drawing the figures. Dar, A. A., & Anuradha, N. (2018). Use of orthogonal arrays and design of experiment via Taguchi L9 method in the probability of default. Accounting, 4(3). https://doi.org/10.5267/j.ac.2017.11.001.